As expected, Hammersmith and Fulham Council’s planning applications committee last night, Wednesday, September 12 approved the proposal for outline planning permission, subject to conditions and a legal agreement for the redevelopment of 57 acres of land at West Kensington and Earls Court. The approval comes despite continued protests from the majority of residents in West Kensington and Gibbs Green housing estates, whose homes would be bulldozed to may way for the scheme. It also comes despite the fact that a design team formed at the invitation of the two local councils involved, Hammersmith and Fulham and Kensington and Chelsea, has said it does not support the application in its current form. The £8billion regeneration scheme is the biggest new project in the capital since Stratford was transformed by the Olympics and the council says it mean thousands of new homes and jobs. The planning application, based on Sir Terry Farrell’s masterplan, proposes the redevelopment of the Earls Court Exhibition Centres and Lillie Bridge London Underground Depot as well as the West Kensington and Gibbs Green housing estates. Along with the recently approved Seagrave Road planning application and an application submitted to the Royal Borough of Kensington and Chelsea for the remainder of the redevelopment proposals, the council says it would create up to 7,583 new homes, of which 760 will be replacement estate homes and 740 will be additional intermediate affordable homes. It will also include new shops, offices, leisure facilities, public open space, a new school, new transport links, healthcare centre and community centre and will create up to 9,500 new permanent jobs and 1,500-2,000 jobs per year in construction. Earlier this month, H&F Council’s Cabinet agreed to enter into a Conditional Land Sale Agreement (CLSA) with EC Properties, a subsidiary of Capital and Counties Properties PLC, and the council says once this CLSA is signed the council will eventually receive a total of £105million, an estimated £54million of which, after compensation and costs, would be available to be reinvested back in the Borough. However, at this stage it is still by no means certain the scheme will actually go ahead. H&F will now refer the planning application to the Mayor of London, while the Secretary of State also has the discretion to call it in. Both the residents of the local estates and the Association of Events Organisers, who are fighting to save Earls Court Exhibition Centre, have called on the government to intervene. 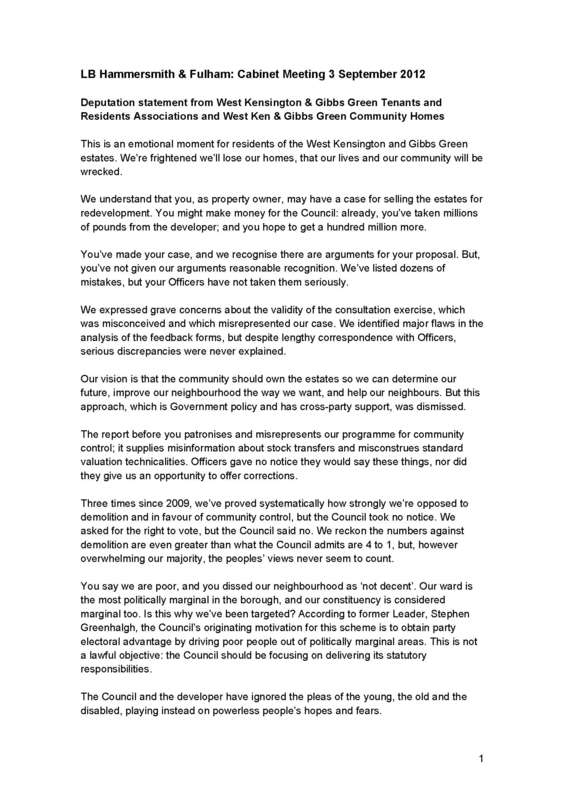 Residents of West Kensington and Gibbs Green, who have their own blog The People's Estates have vowed to take their fight to the High Court say that this week, a report was handed to the police alleging Misconduct in Public Office by Hammersmith and Fulham Council. They are also drawing attention to a report by the Earls Court and West Kensingto Review Panel, which was formed by invitation from the two boroughs involved, Hammersmith and Fulham and Kensington and Chelsea. "The Panel does not support the application in its current form and remains to be convinced that the Applicant's proposals are an acceptable scale and desirable form of development for this strategically important London site."